Please consider this your personal invitation to join us for some insightful Adult Education courses that are offered on an ongoing basis. There is no charge to attend (though donations are gratefully accepted). Mondays at 7:30pm - Read Hebrew - a crash course in Hebrew Reading with Muka (also Carlsbad Village). 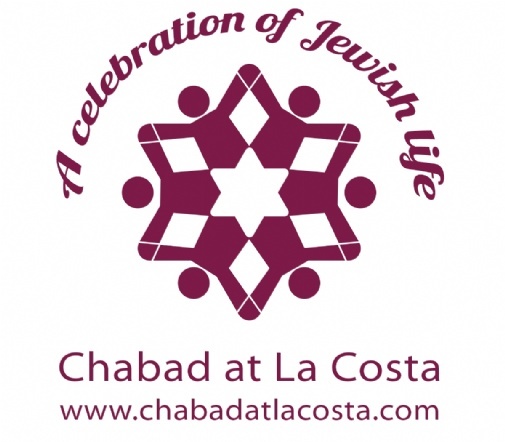 Wednesdays at 6:45pm - Torah Talks - Chasidic masters have exhorted us to "Live with the times," and explained this to mean that a Jew must live with the weekly Torah portion. During this class we explore the Parsha/Weekly Torah Portion using traditional sources, commentaries and stories, and connect the lessons to our modern world and personal lives. The lively discussions are thought-provoking and memorable. Wednesdays at 8:00pm - Kabbalah Concepts - Chasidic Philosophy / Jewish Mysticism with the Rabbi. Join me as we plumb the depths of Jewish Mysticism and uncover the very purpose of our existence. Have you ever wondered how the world looks and the dynamics of the inter-relationship of physicality and spirituality from the Creator's perspective? These are the subjects we will look into and much more! I hope you take advantage of these opportunities to expand your mind and enhance your appreciation for our heritage. Please join us and please bring a friend. 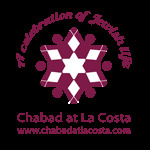 Chabad at La Costa offers a wide variety of Torah classes for adults. Please select from the menu below to find out more about these exciting educational opportunities!